The garden of this property is more than a yard, it is a vibrant, natural world inhabited by many creatures. From inside the home, it appears as living art framed by windows and doors. Diana and Stu, the current owners of this 3+ acre property, purchased it from the heirs of the previous owners in the mid-1990’s. The home was designed by local architect Farro Essalat in the general style of English and east Coast architects working in the “Arts and Crafts” period of the early 20th century. Landscape designer Katsy Swan created an English-style garden to complement it. The garden is a gathering place for friends and family and has been the site of a number of local fund-raising events. A strolling path encircles the property that allows the walker to encounter woodlands of oak and redwood, a small pond, the guest cottage with its rose garden, a putting green, the solar panel array and numerous planting features and beds. Near the kitchen, an organic vegetable garden supplies the family with greens, herbs, tomatoes, apples and root vegetables throughout the year. After removing numerous thirsty plants that are traditionally part of the “English” garden, Ms. Swift and her crew designed new plantings of native trees, bushes and flowers while keeping to the original garden design aesthetic. They composted and mulched extensively to improve the soil and reduce water use; replaced the lawns with native grasses; mapped and updated the extensive irrigation system using water-saving practices if possible. Their work and maintenance use no toxins or synthetic chemicals on the property. The garden has truly become a beautiful and healthy haven for every living thing. Click here for a map to the property. “A new addition to the garden, the tea plants are an experiment in growing organic tea leaves for green and black tea. The starts come from Oregon, where a family farm cultivates, produces and sells teas from mature plants originally brought from Asia.” Diana started seedlings in pots and now has ten plants around the border of the vegetable garden. 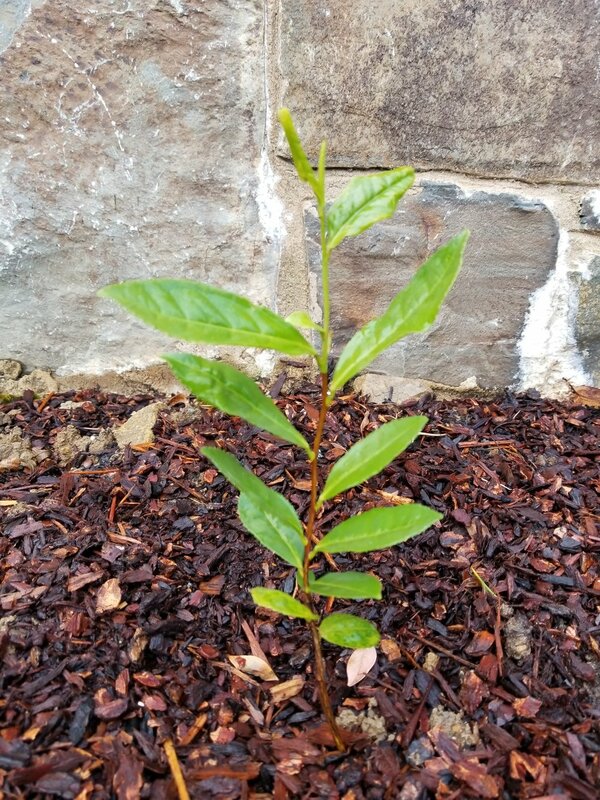 Camelia sinensis is used in containers, as a landscape and garden plant, hedge, screen, or foundation plant. This fast-growing, durable ground cover is all around the property and bears 1 ½ inch long, glossy, dark green leaves and bright blue flower clusters. Despite its coastal origins, ‘Yankee Point’ will grow inland with no watering once established when sited in partial shade. Judicious pruning is recommended to maintain a dense form and promote vigor. The showy flowers of milkweeds offer abundant, high quality nectar to pollinators, making them notable honey bee plants. An enormous range of other pollinators from hummingbirds to butterflies are frequent flower visitors. Milkweeds are named for their milky, latex sap, complex chemicals that make the plants unpalatable to most animals. Choose wisely - some varieties spread like wildfire! A wonderful native evergreen shrub with glaucous-green oval leaves. Extremely showy and drought tolerant. Hummingbird Sage is a perennial native to coastal California from Napa to Orange. It is deer proof and can tolerate dry shade. A dependable and floriferous selection of the native Douglas iris, with springtime flowers and broad shiny blades that are mostly evergreen. Too much summer water on heavy soils will prove fatal. Deer resistant. The tree is an excellent choice for attracting wildlife, including some highly desirable songbirds and swallowtail butterflies. Coyote bush attracts birds and butterflies and can tolerate deer, erosion, drought and dry soil. It is said to be fire resistant. Bentgrass has a deep green color, with medium leaf blades. Grows under 6” tall and uses half the water of a regular lawn. Creeping Red Fescue is a fine bladed grass with medium to dark green color. It is easily established from seed and spreads with rhizomes with a "creeping" growth habit. Its major use is for dry shaded areas as either a pure stand or as a mixture in other grass seed mixtures. Even though it is one of the best grasses for use in shade it will tolerate full sun conditions although this could require more water. Creeping Red Fescue is used extensively in all types of turf areas including parks, roadsides, lawns, fairways, cemeteries, airfields, and other turf areas. Idaho fescue can be used in xeriscape design and can survive years without maintenance. It’s an excellent plant for all regions of the arid West. It has a formal upright appearance that is quite effective in a mass planting. It is a cool season crop; clump forming; foliage is variable green to blue-green. Native to much of North American, this pretty, bright green form was selected by David Fross near the Mokelumne River. A nice grass to use in the woodland garden, it does well in dappled shade with only occasional water, making a good choice for planting under oaks. Purple needlegrass is a densely tufted, long-lived, upright perennial bunchgrass with long awns. It is an excellent native grass for use in low water landscaping; it has been used in native grass lawns, but its bunching habit prevents it from forming a uniform sod. It goes dormant in the summer and greens up in fall with the first rainfall and the shorter days. Note: Animals such as dogs have been known to get the seed lodged in their fur.